The legitimacy of certificates affects our security involving everything from web browsing to VPNs. Businesses have flourished on the internet because of the ability to perform secure transactions. However, without the validity of SSL certificates your business can be compromised. How do you know you can trust certificate authorities? Once trust is lost, business is lost. 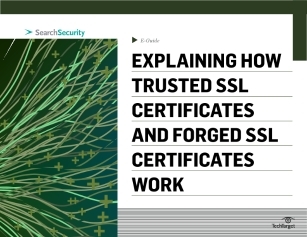 Michael Cobb, founder and managing director of Cobweb Applications Ltd., explains in this expert e-guide how forged SSL certificates undermine the security model. Read now to discover why maintaining this trust is important.